For the very first 10 Miles back in 1986, 800 participants gathered at the start. In 2007, for the first time more than 10,000 people entered and in the years to follow the event grew spectacularly. 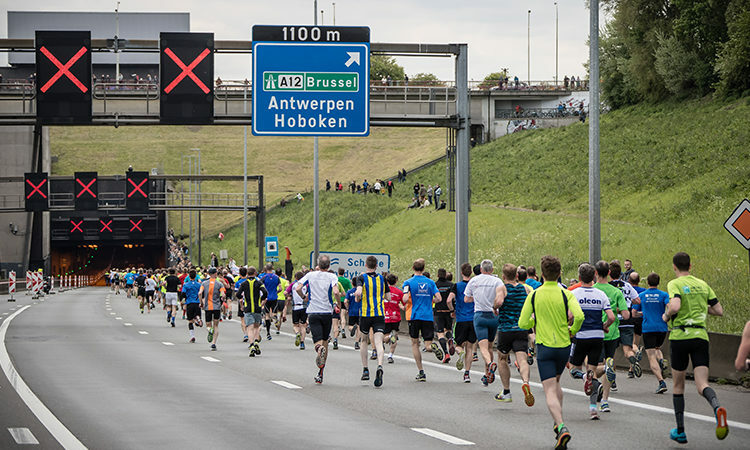 During the past five years, approximately 40,000 runners showed up at the start, making the Antwerp 10 Miles & Marathon the biggest running event in Belgium. Sunday, April 22, 2018 at noon, the start of the Antwerp Marathon resounds on Linkeroever. With over 3,000 participants, it is the most popular Belgian marathon ever. For Tabaknatie the challenge lies in watching Rien Jagers and Philippe Colmont crossing the finish line of the 2018 Antwerp Marathon edition. Next to our 2 Marathon runners, Tabaknatie also provides a team for the short run (5km) and naturally one for the legendary 10 Miles. The weather forecasts indicated temperatures rising above 20 ° C. Accordingly participants were urged to always listen to their own body and to hydrate sufficiently, even before the game. All participants walked around the earth 15 times on Sunday, 40% of the participants are women and there are no less than 125 different nationalities joined at the start. Tabaknatie is extremely proud of Rien Jagers (4:56:29) and Philippe Colmont (4:14:40) to have reached the Marathon finish. Matthias Dierckxsens (1:29:16) was the first to reach the finish line for the Tabaknatie 10 Miles team, for the Short Run (5km) team it was Daryl Moens (25:34) who made us proud.